Finally. Snow. In my opinion, it's the only thing that makes the cold and bitter winter weather worth it. I don't think I would ever be able to live somewhere that didn't have snowfall in the winter time, and lots of it! Having lived all over the country before the age of eight, I've been able to experience the brutal cold that Michigan has to offer, the wonders of having a million amusement parks in Florida (when you're four, this is a big deal), the beauty of the Pacific coast in California, and the incredibly beautiful seasons in New Jersey. And although my memory as a child wasn't the best, I have to say I'm incredibly glad I ended up on the east coast where I get the most of what each season has to offer. And I know what you guys are thinking. Boat Shoes? In the snow? Come on, Jen, you're not even on a boat! Have some sense. My response? I do what I want. But in all seriousness, they provided great traction in the snow and I couldn't help but wear these babies out. I'm kind of obsessed. You'll definitely see them around all the time when the warmer weather approaches. I think it must be so cold! 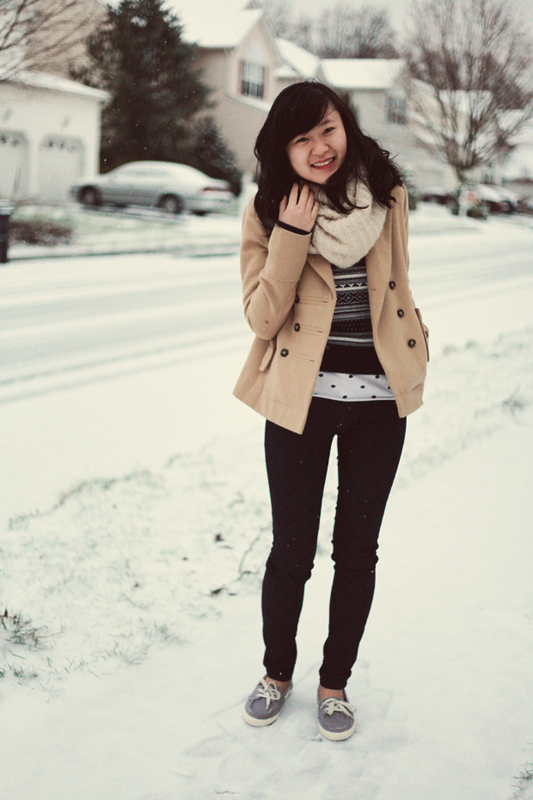 I love this outfit in the snow! We had a spell of snowy weather here in Poland but now it's all turned into lakes and mud puddles with temperatures of 10 degrees above zero! you really having mastered the art of mixing patterns flawlessly!!! Oh Jen... I do the same things in crazy weather, for example today I will probably wear wedges while strolling through a park. Actually you're more sensible than I am, at least you're wearing flat cute boat shoes, maybe I'll change my game plan. 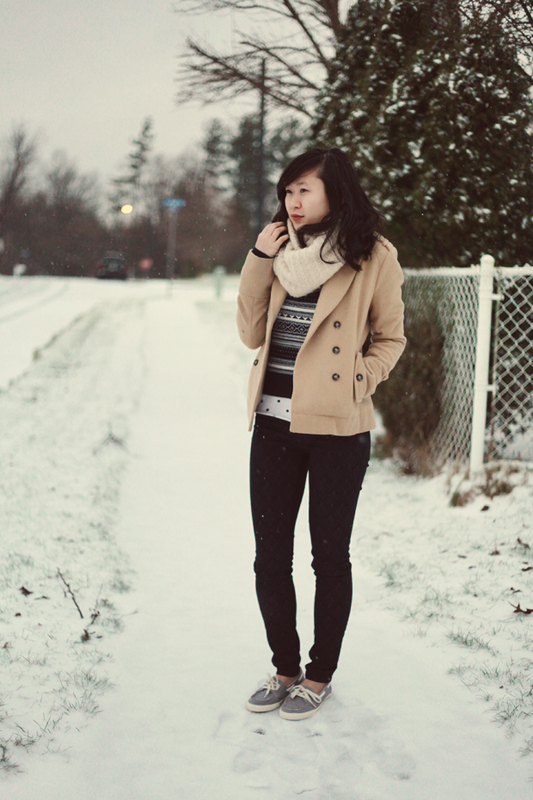 Ha, I really like the scarf along with your beige jacket, super cute outerwear! Ahhh! I'm pretty sure this is one of my all-time favorite looks of yours. The layering is so chic, and I'm in love with your pants!! It also makes me happy to see photos featuring your smiling face :) Keep rocking the confidence, lovely lady! P.S. I'm about to go take the outfit photos for my guest post. Woohoo! I'm so super jealous of your snow! We get the cold (usually) but never the snow! 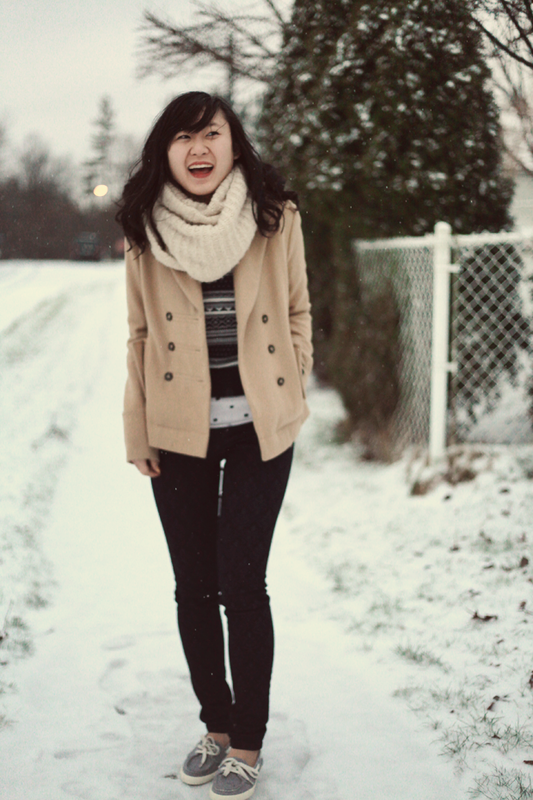 I'm glad that you're one of those people who embraces the snow, though, and doesn't get all cranky about it. ;) Though I guess I could see how it could get annoying... bah! What am I saying? I love the subtle baroque print on your pants, and you keep on doin' your thing and wearing boat shoes in the snow, Jen. SHOW EM WHO'S BOSS. the snow looks amazing! i am a tad bit jealous, as it looks like a blast! Such a cute outfit! The snow looks so pretty! And I LOVE the shoes! wanna switch places?! we have tons of snow in my city!! hahaha! Hurray for snow!! 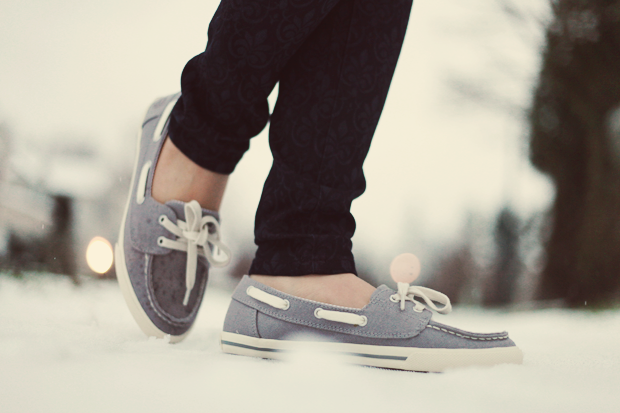 And boat shoes! I wear my boots in the snow but they don't have any traction so I always slip all over parking lots. Good thinking with the traction on your shoes. Haha! I was just about to call you out about the boat shoes...but then in the next paragraph you called yourself out, so now I can't harass you. Boo. Love the look, but don't freeze your toes off! I always like how you mix and match patterns. The polkadots with the striped sweater is really neat. Ohh mann im missing out on the snow there! Definitely love jersey too for having all the seasons plus the shore. How fun that you have snow now! 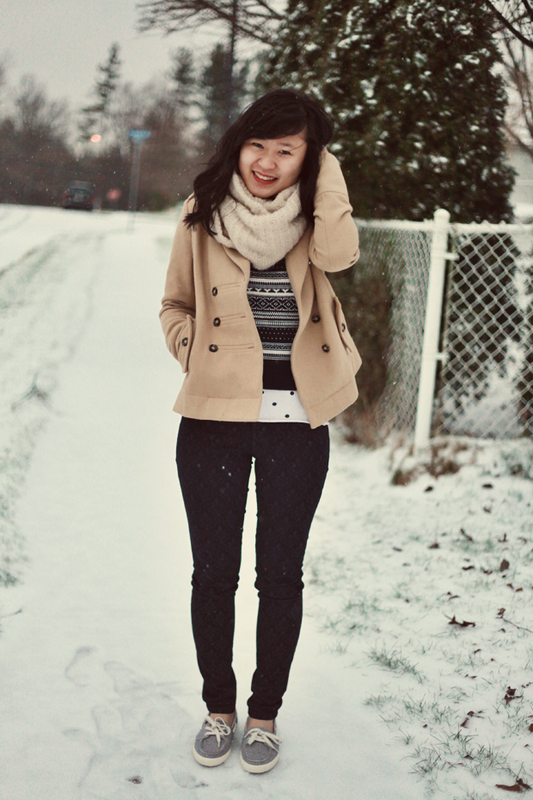 Your winter outfit is so cute with the sweater and the wool coat, but I love those jeans. I didn't even realize that they had a pattern on them until that last picture, it's really cool looking! Your photos are so gorgeous - what a lovely winter wonderland! And you look so cozy in that warm scarf! I love how you mixed the prints. And you must have been freezing your feet, no? I've never even seen snow in my life, which is sad, I know. I love Miami, but some snow would be nice once in a while. It's so whimsical. I love your camel coat Jen! and did I mention how awesome the card you sent me is? so creative! !